vacancies in SSA AP Prakasam District recruitment 2018 for KGBV and ZPHS Schools. 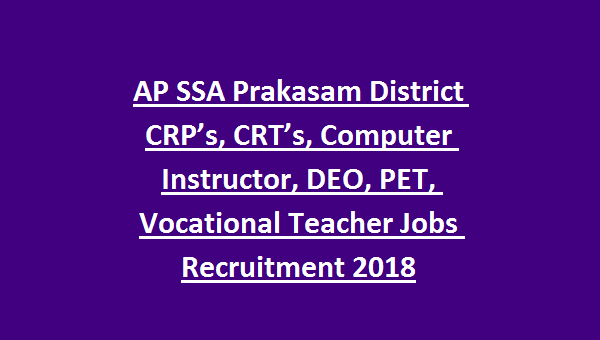 Last date to submission of application form to SSA AP Prakasam District recruitment 2018 is 15-12-2018. These vacancies are purely outsourcing basis. So you have to submit your application form to Respective recruitment Agency only. 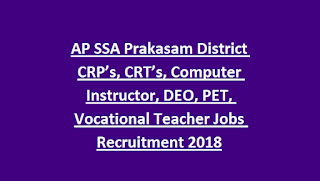 Vacancy details, qualifications and other details are given below for this SSA AP Prakasam District Teachers Jobs. There are total 75 posts in this AP SSA Recruitment of Prakasam District Govt Schools. Check here for Post wise qualifications. Upper age limit for general candidates is 39 years. For reserved candidates upper age limit is 44 years. Candidates selection for teaching posts will be held written exam and merit in qualifications. Written Exam will be conducted for 100 marks. Written Exam dates are 09/10-01-2019. For non teaching posts recruitment will be held by outsourcing agencies. Candidates who are applying for teaching they have to submit their application form to Office of the SSA Sarva Shiksha Abhiyan, Project Officer, Prakasam District.